The first time I heard about homeschooling I thought, “Why would you do that to a child?” My reaction was based on stereotypes, not on experience or research or simply knowing real-life homeschoolers. Obviously I changed my mind 😉 I know so many benefits to homeschooling, especially since our kids are in college now! But are there any reasons to homeschool that aren’t good ones? Are there reasons that will lead you to want to give up? That just aren’t enough to sustain you when things get hard? 1. Your goal is to have children who are more intelligent than others. Whether this means you expect them to get scholarships to Ivy League colleges, have an impressive transcript, or you simply want to show-off all they know to family or friends, “To have the smartest kids” isn’t a good reason to choose homeschooling. There are two major problems with this reason. First, pride motivates us. We feel we must prove to others how smart our kids are (sometimes because we think it justifies our decision to homeschool). We start homeschooling with an “I’ll show them” attitude. Ultimately this reason is more about us than our children. We find success only through theirs. Second, we can’t really make goals for another person. As I wrote in 3 Things We Can Do When Homeschool Reality Strikes, we can’t have goals for others, only desires. Goals and desires are two different things. We can set goals for ourselves. We can even set goals that support our desires for another. And we can guide our children in setting their own goals. But we cannot confuse our desires for our children as a specific plan we can accomplish. For example, my husband and I have the desire for our children to grow up, strong in their faith, loving God with their heart, mind, and soul. But if I make the outcome my goal, I run the risk of becoming bitter and angry if my children don’t turn out the way I envisioned. They have sin natures and free-will, so I can’t make them love God. However, our goal can be to provide an environment and home conducive to this desire. We can take our children to church, treat them with love and respect, create family memories, be available to talk and listen, and model our own faith in day-to-day life. You desire to provide your children an individualized education. One that respects each child’s particular bent taking into account their personalities, interests, and gifts. 2. Because your best friend decided to homeschool her children. Your best friend may be a great support, but the day-in-day-out of homeschooling will be up to you. So when the house is messy and the kids are whining and you are picking up the phone to order pizza again, remember your best friend will be busy dealing with those things at her house. Or when you face opposition from friends, family, or even strangers—unfortunately no one else will be there to take care of it for you. And guess who gets to pay for all those books, resources, and field trips? You and your husband know it is the best choice for your family. And since your best friend has decided to homeschool also—you can be excited to support one another. You already have a little community! 3. Because you are fearful. You’ve seen the violence and evil in the world. You’ve read the statistics of young adults leaving the faith after they graduate high school. And you live in that same world, understanding the hurt and pain and grief life brings. But unfortunately we can’t make our kids safe from all the bad things in this world. Does this mean we should send our kids to public school? No, but it requires a change in mindset. When we act out of fear our mindset is about control—trying to control circumstances, instead of trusting God. Creating an environment conducive to growth under our protective wings is very different. Fear isn’t a healthy motivator. You choose to homeschool because you are courageous. 2 Timothy 1:7 says, “For God gave us a spirit not of fear but of power and love and self-control.” Yes, you know this world is scary and dangerous. Therefore you want to prepare, to equip, your children to live in a world that is increasingly hostile to Christians. Your desire is to disciple them. 4. Because you believe there is a parenting formula that produces certain types of adults. Our children aren’t math problems. A+B=C isn’t always true. We all have a sin nature and free will. We all make choices. As parents we can do our best to provide the best possible environment. We can take them to church, love them well, and communicate effectively. But we can’t guarantee the outcome. God, who is the perfect parent, has children who rebel. Why would we think that wouldn’t be possible for us? You decide to homeschool because you trust God. Ultimately as parents, we can only do what He has called us to do. To follow the commands He has laid out in Scripture for us and pray. Then we have to let go and trust. Trust him to continue to work in their lives, wooing them to himself. Remembering He is the Blessed Controller of all things, and we are not. 5. Because you think others don’t have anything to offer your children. This particular one often comes from the fear mindset. You know that other’s will sometimes teach your children things you disagree with, or their peers won’t always set a good example. And so you want to isolate them from the possibility that they will be led astray or hurt. These are legitimate concerns, of course. But there are many benefits from leaning from and with others, too. You want to help your children find true community with like-minded friends and support for their walk with Christ. Homeschool because you know there are so many things other people have to offer your children, people of all ages. And actively seek out opportunities for them to develop healthy relationships with others. If you already homeschool why does any of this matter? In his book, Start with Why: How Great Leaders Inspire Everyone to Take Action, Simon Sinek writes about the importance of business leaders knowing their why. When businesses know their why, it guides them in how they do business. It transforms their business. When we know our why, we can let it be a guide for how we homeschool. So why do you want to homeschool? Is your “why” enough to get you through the tough times? Or maybe you are discouraged or tired. Perhaps you want to give up. 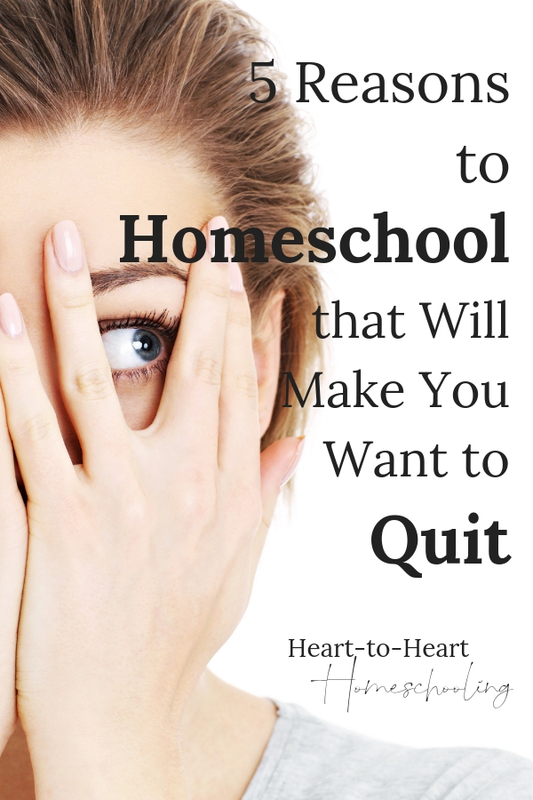 Sit down and reflect, “Why did we choose to homeschool?” and be honest. And if you find that maybe what motivated you then isn’t going to sustain your efforts, choose a new why. i loved how you paired the reasoning. Well written. Thank you for the balance you share in this…no false promises. You are welcome 🙂 Obviously I’m a big believer in homeschooling, but I believe our “why” does matter!